The humble index card. 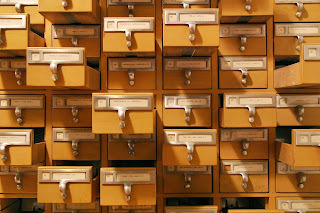 They are hardly used for their original purpose any longer, though I am certainly old enough to remember going to our local library when I was young and rifling through sets of drawers like the ones pictured to find out if the library had a specific book and if so, where to find it. 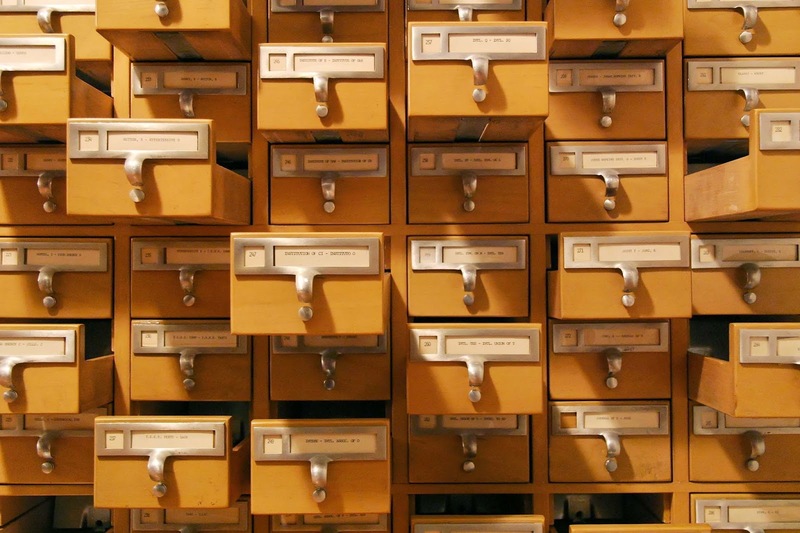 There was an excellent article online about index cards: How the humble index card foresaw the internet which explained how these 3x5 inch cards were used to create indices for all sorts of things. It's a longish read but it's absolutely fascinating! Do go and check it out. Nowadays I would think that index cards are used for many more things than cataloguing or indexing. I used to work in a university and students used index cards as 'flash cards' for revision. As a writer, I use stacks of them to help plan a book (see my post here about how I use them). I have them in plain, lined, coloured... you name it! I use them almost as much as I use Post-It notes. For those Filofax users out there, a 3x5" card fits beautifully in a pocket-size Filofax. Although card indexing is possibly a dying art, I feel sure that the humble index card will be around for a long time yet. Let me know in the comments what you use index cards for?